Hiro Higuchi was another well-known minister from Hawaii, who was assigned to the Second Battalion of the 442nd RCT. Born in 1907 to Reverend Kan Higuchi and his wife, Tsuya, young Hiro knew that he would enter the ministry like his father before him. He moved to Los Angeles to begin his formal theology studies and there he met his future wife, Hisako. They returned to Hawaii, and Hiro subsequently took a job as head of the YMCA in Waipahu. Ordained in 1935, the reverend was an ardent pacifist but decided to follow and support the many YMCA boys who volunteered for the Army into battle. In Italy, Chaplain Higuchi found himself preaching and praying with his men as bullets and bombs exploded around them. As with the other chaplains, he raced from foxhole to foxhole where he read Scriptures and boosted the soldiers as best he could. Keeping his own nerves intact, he once stayed with a forward aid station to be with the wounded and dying men during a five-hour enemy barrage. He also worked behind enemy lines, in one instance to pick up the body of a missing sergeant in a heavily mined and booby-trapped area. But taking the time to find the living among the dead was a task that sometimes paid off for the chaplain. On one occasion, Chaplain Higuchi found a soldier who was still breathing among the dead bodies, so he moved him with the wounded to be transferred to a hospital. Years later, the man traveled from Boston to Hawaii to thank the chaplain for saving his life. Chaplain Higuchi was inspirational to the men of the Second Battalion on several levels: as men, as soldiers and as Americans. It was his belief that the Nisei soldiers should know that they were contributing to the war effort as skilled Army personnel who were fighting for freedom and democracy – not as secondary citizens trying to prove that they were good Americans. In a sermon, he told them, "You are already good Americans, and you don’t have to prove it. But if you are here because you don’t like Hitler, Tojo, tyranny and the kind of murderous dictatorships and super nationalism they represent, then that cause is the right one." For Higuchi, the darkest memories of the war include watching 800 soldiers of the 442nd go into battle and only 200 return. Struggling to find answers for those soldiers trying to understand God was his biggest challenge. They had understood their duty as soldiers and come to terms with the war against the Nazis, but many of them became depleted spiritually. One soldier, in dealing with a moral dilemma, asked him about the commandment, "Thou shall not kill," after having killed a number of Germans. The chaplain replied, "This is not going to last forever. It’s either you kill or get killed. Your cause is the right one. God won’t punish you." But in a somber moment before the unit left on the mission to rescue the Lost Battalion, another soldier engaged him in a dialog and asked, "What is God to me? What am I to God?" To that he had no immediate answer. Having witnessed all the horrors of the war and questioning his own beliefs, Higuchi returned to Hawaii in 1946 and planned on quitting the ministry. But colleagues of the talented and popular pastor convinced him to reconsider his decision, and he decided to go to Oberlin College in Ohio to continue his theology studies. According to friend and 442nd veteran Ben Tamashiro, while praying in the dead of the Ohio winter, Reverend Higuchi heard the voice of God directly for the first time, and at that moment decided to accept a church assignment on Kauai that he had previously refused. After he finished his graduate work, he returned to Kauai to find a deeply meaningful and happy period of his life and the belief that he could once again uplift the lives of people in their daily lives. Chaplain Higuchi was awarded the Legion of Merit twice and the Italian Cross of Military Valor. Because he was wounded in Italy, he was eligible for a Purple Heart but turned it down in part because his friend Danny Inouye (later to become Senator Daniel Inouye of Hawaii) was brought into the aid station at the same time with a severely damaged arm. 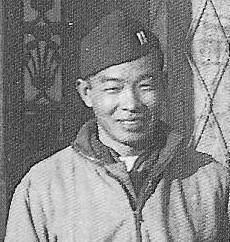 But the compassion and good humor of Chaplain Higuchi was not forgotten among the boys of the 442nd. After the war, he became known as "Colonel Superintendent" because of the five churches and numerous other building projects he spearheaded across Hawaii, including the Waipahu Community Church built almost entirely by 442nd veterans. Reverend Higuchi continued his community service, including his role as chaplain for the Army Reserve, until shortly before his death at the age of 74.